Mickaboo received this message and forwarded it on to me (MickaCoo) on 3/14. 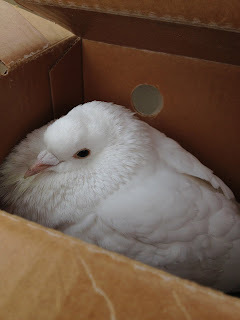 Last night a white pigeon came to our doorstep. 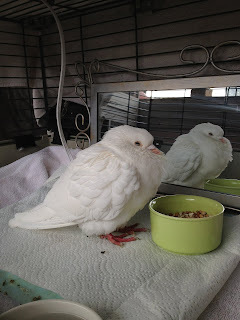 My husband picked him up and we have him in the back bedroom in a rabbit hutch (and lots of paper underneath to catch his poop) with water bowls and feed (sunflower seeds and corn scratch - we have chickens). The bird has a yellow band. We live in the Montclair neighborhood in Oakland and a storm has just arrived and we don't want to release him out in this weather. But we think he is stressed (we have workmen at the house today below with machinery and other pets as well, though he is alone in the back bedroom). 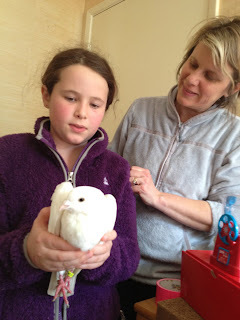 We were full up and the Good Samaritans that took the bird in agreed to foster until a space was available. I provided some care recommendations and, at first the bird seemed to be OK, eating, pooping, wing-popping. Unfortunately, on Sunday 3/18, his rescuers could tell he wasn't feeling well and I made an emergency visit. He was very emaciated and weak, despite having a safe place and plenty of food. I brought him home to try and stabilize with sub cu fluids, supplemental feeding and heat. He was a lovely homer and the family that rescued him named him Vanilla Truffle. I thought of him as Tucker. He was the same at midnight when I checked on him but dead in the morning. I don't believe in an afterlife. I believe that Tucker lost everything he had. I believe that's what makes life meaningful- it is all we get. We need to make the most of it, for ourselves and others, just in case there is no other chance.